VATICAN CITY (CNS) — Like many Catholic parishes, the Vatican has turned to a raffle to raise money; the difference is, though, the prizes are items originally given as gifts to Pope Francis. For 10 euros — about $12.50 — anyone can go to the Vatican post office or pharmacy and buy a chance to win a Fiat Panda 4×4, a small SUV “fully loaded” with every option available, the Vatican said. Tickets are not for sale on the Internet or anywhere outside Vatican City. 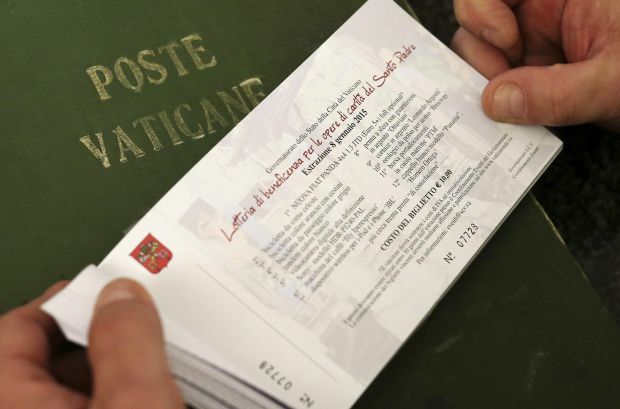 The raffle is being run by the Vatican City State governor’s office, and proceeds will be placed directly “at the disposition of the pope himself,” said Jesuit Father Federico Lombardi, Vatican spokesman. First prize is the Fiat. The other main prizes include: a blue racing bike, an “orange bicycle with baskets,” a tandem bike, a small HD digital video camera, an espresso machine, a silver pen, a brown leather briefcase and an authentic Panama hat. In the small print, it specifies that the winner of the Fiat will have to pay Italian value-added tax and automobile registration fees. The winning tickets will be drawn Jan. 8, and the names of the winners will be published on the governor’s office website: www.vaticanstate.va. Winners will have 30 days to collect their prizes. God bless him, what will he think of next? ?